How is Gemma dancing under the weight of that hair? She deserves extra points for that alone. Not a bad choice to start the week, with a rip-roaring song that was actually suited to a quickstep. Gemma felt a bit clunky in hold to me and like she was struggling to keep up at times, but then the quickstep often looks exhausting. She might struggle this week, but her and Aljaz have such a great partnership it might see them through. This made such an impression on me, I could not remember what it was. So I have just been on iPlayer for a rewatch. Now I feel bad because it's Hello Dolly and who doesn't love that? But oh, all the faff. 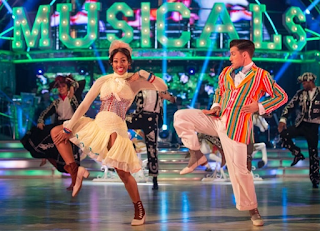 Well they look divine, the perfect choice for them this week...apart from that it's a rumba. It was always going to be a tough one for Mollie, so they seemed to cope it with it by putting not a lot of rumba in it and and an illegal lift. There were snatches of good bits in her arms, but also only tiny bits of hip action. The judges seemed to like it, but it might have committed the cardinal sin of being boring. I was also CACKLING at the awful slapdash scrapbook someone had put together for their VT.
Oh, Shirley. Just no. And also I spent most of the routine freaking out about the weird time signature, which I have been reliably informed on Twitter was 12/8. Doing a samba dressed for a Charleston, in fact this was one of the weirdest mash-ups we've seen on the show...but I actually quite liked it! Cabaret is surreal anyway, and Katya put a great routine together - it had more content in it than Mollie's rumba that's for sure. And Joe executed it very well with good bounce and aplomb, is there nothing you can't throw at him? OK, I know all the words to this. But samba? No. It hurts my soul. They really want all out on the costumes, and probably got one of the more sensible themes for the night. This was very flowy without being wafty and not over the top or melodramatic, I was quite impressed. Also, the the lifts were well-executed rather than death-defying and wobbly. It hit all the right spots and actually showed some progression, hurrah! We are still pretending that 'The American Smooth' is an actual dance rather than a dance style from the US, are we? I've been letting it go for a few series but I'm grumpy so I'm bringing it up again. I liked this better on second viewing. I just would have preferred it if they weren't dressed as cats. I know that was the point. But unnecessary. Totally. Nadiya's hilarious perm, Davood making descending from the ceiling his signature move, this was definitely the peak of themeing madness for the evening. Which was a shame because there was some good AT in there, including a great jigsaw-legs section (yes, that is a technical term). The lifts were oddly clunky though, Nadiya was basically launching herself at him. I have no idea how the audience will take to this oddness, but hope he doesn't go out on what was basically a blip. What a waste of what should have been an excellent Argentine Tango. Ugh. Gorka's jacket, my eyes! I literally recoiled from the screen when he first appeared. But this was the most jolly, charming routine I've seen in a long time. Alex's swivel was so sharp, she could even do it in a high-kick, so I assume she just doesn't have normal working joints like the rest of us! Also managing to keep up the energy right until the end - considering Craig said she was better than Gorka I don't know what she's supposed to do to get a 10 from him. Great end to the show though! Finally, a dance where the theme didn't completely ruin it. Alexandra could have out-swivelled a Swizzel lolly on a carousel.